Audi has put a new topcoat paint shop into operation at its plant in Ingolstadt. Board of management member for production Prof. Dr Hubert Waltl opened the 12,000-square-metre building together with plant director Albert Mayer and group works council chairman Peter Mosch. Up to 900 car bodies a day can be painted in the new shop on three floors. Thanks to environmentally friendly technology, the modern application equipment will conserve resources while ergonomically designed workplaces will make the employees’ work easier. Approximately 200 employees work in the new paint shop in three-shift operation, supported by 54 painting robots, 36 handling robots and eight cleaning robots. 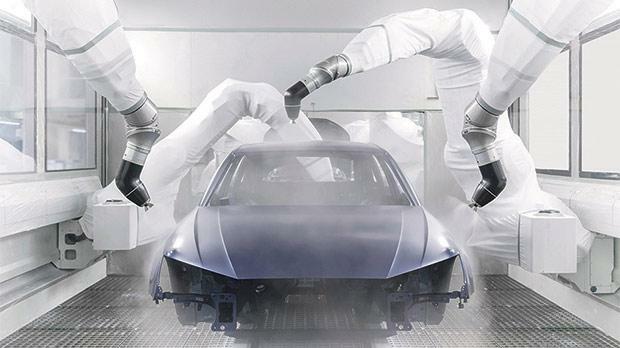 The models Audi A4 and A5 are currently painted in the new paint shop, later to be followed by the Audi A3 and the Q2. The new paint shop is one of the most environmentally friendly in the world, resulting from state-of-the-art technologies such as air recirculation, dry separation and exhaust air cleaning. These measures allow a significant reduction in the use of resources, so that heating energy and water consumption per car are reduced by 20 per cent. Air recirculation also helps to reduce CO2-emissions per painted car by 30 per cent, while the cleaning of exhaust air reduces emissions of volatile organic compounds by 90 per cent. The new topcoat point line-in the north of the plant site also introduces state-of-the-art painting technology at Audi: paint-application equipment with robot technology and electrostatic high-speed rotation spray guns carry out the painting process fully automatically. With the so-called bell-bell method, paint is applied only electrostatically, thus achieving higher efficiency. In combination with dry separation, this also benefits the environment.